The heart of rotary tube cutting is the blade. Continental has refined the materials, heat treat and processing steps for our blades to produce the most durable and economical blades available. Made of shock-resistant tool steel heat treated for smooth cutting and long life, Continental’s cut-off blades are hard turned, not ground. This insures a blade with a superior surface finish and grain structure and means thousands of cuts between sharpening. Plus, they can be re-sharpened up to 30 times. This means your cost-per-cut is very low compared to other methods. Standard blade models are available from stock for immediate delivery. Continental’s standard blades are 7” in diameter. Special bevel and diameter blades can be provided on request. Blades are available in 4” up to 8” diameters, with bores, pinholes and keyways to meet your needs. We also manufacture pipe and tube cut-off blades for most other rotary cut-off machines, including those made by Amada, Rabbit, Hautau, Modern Machine, Landis and Bardon’s & Oliver. Contact us for a quotation. Continental can provide blades for your machine! 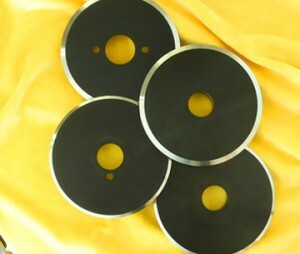 A factory direct, FAST sharpening service is also available.